Home » Articles » 7. Skin problems? How often do you have a bowel movement? About 80 percent of people suffer from ­constipation at some time during their lives (Source: American Society of Colon & Rectal Surgeons). When your stool doesn’t want to leave your body, it causes constipation. Your abdomen becomes painful after a few days. Normally a person goes to the toilet daily or once every two days to have a bowel movement. When you are having trouble using the toilet, you go only once in 3-7 days. If you go once a week, your bowels are not working properly. From my former practice I remember a woman who only had one bowel movement a month. She had horrific abdominal pain! Thankfully the treatment worked well for her and she quickly was able to once again go daily. She was literally and figuratively relieved! What I have noticed is that we are dealing here with a problem that is more prevalent among women than among men. You will read below that it is actually logical. For me, the problem of constipation is often an emotional one. It’s something we need to pay attention to. When we realize that stools are the waste products from digested food, constipation is actually holding onto “garbage”. It is interesting to ask why your intestines don’t let go of this waste. When your stool stays inside your body for too long, your intestines start to re-absorb the waste products. This is a huge problem, because your body will then become more polluted, which creates disorders. From this, skin disorders such as eczema or psoriasis develop. In Chinese medicine, one is very alert about constipation. They know that many disorders can develop from constipation. In short: sleeping well, and pooping well are the basis for good health! What I noticed is that if someone had a blocked meridian of the large intestine, they were also constipated. If I treated the large intestine meridian, this person could use the toilet again. The important thing, though, was to look for the source of the meridian blockage. Clients turned out to carry feelings of guilt or be perfectionists who feared losing control. There is a link here with carsickness! Women who grief, such as through having had a miscarriage, appeared to be constipated more often and have a blocked large intestine meridian. Why are women more often constipated? They hold onto feelings of guilt, because they try to do too much. They fear being inadequate and they find it difficult to let go of control. With step 1 “Optimize acidity” and step 2 “Detox all toxicity” you encourage your body to eliminate waste products. In addition, it is important that you work in step 3 on letting go of your feelings of failure and guilt. They are often created while growing up with your father and mother. In step 4 “Clear meridians” you work on clearing your large intestine meridian so that feelings of guilt, perfectionism and fear of losing control will decrease. Steps 5, 6, 8 and 9 support the other steps. Step 7 “Fulfill basic needs” strengthens your sense of worth, self-esteem and security. In addition you will be able to forgive yourself for what you did in the past. That was then and this is now. You can reset yourself and begin with a clean slate and… once again use the toilet! Do you recognize what I wrote? Did you notice any improvement in your stool or your skin? I wish for you that everything starts flowing again! P.S. If you found this article interesting, would you please forward it to others? You can find the links for Facebook, Twitter, e-mail and such below. Thank you! 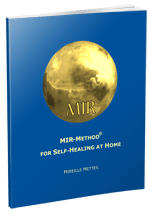 I am using the MIR method since last November but my constipation problem is not resolved neither hot flashes and sleeping problem. What can i do? The best you can do is either continue with the MIR-Method or contact a MIR-Method guide. She can test for you what is the root cause of these problems. Did you go to a doctor yet, to see if it has any medical cause? Hot flashes often refers to step 3. ‘Detach mother’. This can mean that there are still issues with your mother or another woman you can’t let go. Not being able to let go is connected to the large intestine meridian. Sleeping problems can be caused by a blocked large intestine meridian too. Maybe this can make you become aware of something? I have been doing the 9 steps for 9 days. You mentioned we should say the 9 steps in our native language. I have been saying it in English and spanish since I feel a strong connection with both languages, is this correct? Thank you for using the MIR-Method. You can do both languages, as long as you don’t do it more often than 2 times a day, because it is not necessary. For example, you can do English in the morning and Spanish at night. Good luck and let me know what you notice! I just found out about this methode. May i have a question? Is this methode also usefull for vitiligo disease? Till now i tried a lots of medicines, but nothing seems to help me. We have had responses from 1 person that the pigment in her skin is coming back, very slowly. You can give it a try!